Coupon for 100 Clubcard points in the new Tesco magazine – keep an eye out! If you go down to your local Tesco this week, you may see a pile of ‘Tesco Food Family Living’ magazines stacked in a corner. If you do, grab one. As you can see, it is offering 100 bonus Clubcard points when you spend £20 on a single gift card. Excitingly, it seems that this will stack with the current offer of 150 Clubcard points for spending £50 on gift cards. This means that a £60 gift card spend will earn you (3 x 100 + 150 =) 450 Clubcard points which is an excellent result. You would need three coupons for this so stock up on the magazines! 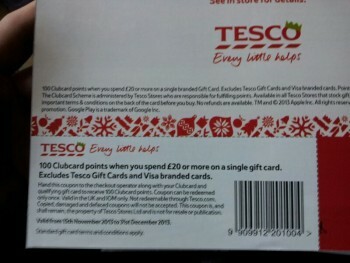 Remember that Tesco gift cards are not included – they must be for other retailers. The coupons are valid until the end of the year.